When I moved eleven hours away from my hometown to begin graduate school, I left behind a subculture that at the time felt increasingly foreign. The Christianity I was raised in had many commendable qualities; it was sincere, it was faith-driven, it was in love with the Scriptures. But there was also baggage. I suppose it is in the nature of faith that eventually, you have to take a critical look at the beliefs you inherit from those who came before you. And among the things I personally had to reconcile was the intense, unflagging centrality of the End Times in the churches I attended in my childhood. Growing up, the Last Days—embodied in the Rapture—was perpetually around the corner. My parents and many of my friends’ parents actively discerned the signs of the times in the nightly news, the cataclysms of nature, the decay of culture, and the dreams of sleep. By the time I began my MA in German Studies (to be followed by a PhD in European History), the apocalyptic worldview that pervaded my growing-up years had grown thin. The longer the Lord tarried in His return, the more I began to recognize the darker side of apocalyptic belief—the seeming chaos of it all, the inability (or lack of desire) to plan for the future, to budget, to create stable systems of Church governance and structure, to engage the world outside strict us-and-them categories. Relocating for graduate school was my ticket out of that. As soon as I settled into my new city, I found myself gravitating toward historical, liturgical expressions of Christianity that seemed to draw on something deeper and older and more constant than the pseudo-prophetic currents of my youth. In particular, I was drawn to Luther. His world fascinated me. The Reformation, or “early modern,” period (ca. 1450–1700), signified the collision of medieval and modern civilizations. On the one hand, certain hallmarks of the medieval worldview persisted, albeit in varying degrees—widespread belief in astrology, for example, as well as the adherence to ritual, folklore, humoral medicine, and an Aristotelian, geocentric cosmology. On the other hand, the Reformation was accompanied by new intellectual and cultural developments that forced people to reconsider the way the world worked. It was the age of the “paradigm shift,” to borrow a phrase from the late and great philosopher Joseph Kuhn. From the religious reformations of the sixteenth century (the Catholic Church experienced a reformation, too), to the Copernican and scientific revolution(s) of the seventeenth, the age of exploration, the “Little Ice Age” (a period of global cooling that affected crops and food supply in certain parts of Europe), and the sundry other transformations that hit society during this period—the world was changing, and according to some, it was changing quickly and drastically. Many of these shifts were accelerated by the invention of the printing press in 1450, which forever altered the way information was transmitted and understood. As fascinating as all of this was, most of my colleagues wouldn’t touch this period with a ten-foot pole. They preferred the familiar contours of modernity or the fantastical elements of medieval epics. For them, I think, early modernity was too outside the box, too unstable—like subatomic particles about to blow up. For me, though, it all felt strangely and comfortingly familiar—I couldn’t put my finger on it, but studying that period was one, prolonged bout of déjà vu. And I dove in. I immersed myself in the great German literati of the era. I was particularly fascinated by the way religious thinkers made sense of the shifting sands around them in the wake of the Reformation. To finish my MA, I was required to spend a full year writing a substantial research thesis. I chose to write mine on Paul Gerhardt, the most prolific Lutheran hymnist of the seventeenth century. But to reckon with Gerhardt, I first had to reckon with Luther. And it was in the course of that research I stumbled upon a facet of the early modern worldview I hadn’t yet considered—its pervasive appetite for the apocalypse. I first encountered this while reading Luther: Man between God and Devil, a ground-breaking historiography by Heiko A. Oberman, the preeminent Reformation scholar of the twentieth century (and to whom I have jokingly referred as my “Doktorgroẞvater,” or doctoral grandfather, since he was the professor who advised my own doctoral advisor). As Oberman saw things, much of what fueled Luther’s tenacity was his unwavering belief that he was witnessing the Last Days, that Christ’s return was imminent, that the devil (not to mention the Antichrist/ Pope) was not only real but profoundly active, trying with all his might to deceive the faithful and obscure the Gospel in these few, latter days. At the time, however, the irony was largely lost on me. It’s only in retrospect I can see that in my research and academic writing, I was not only trying to make sense of the past, but also my past—the jumbled apocalyptic soup back home that had never quite made sense to me. I was learning to unpack the spirituality I had acquired from my own forebears, learning to sort it all out and determine how to move forward as a person of faith in a meaningful, constructive way. To be sure, Luther’s brand of apocalypticism was hardly without its own kind of darkness. His baldfaced comments about Jews and Turkish Muslims (and above all the Catholics) is enough to make modern readers squirm and/or blush and/or incite him for hate speech. And then there was the potential for disillusionment. 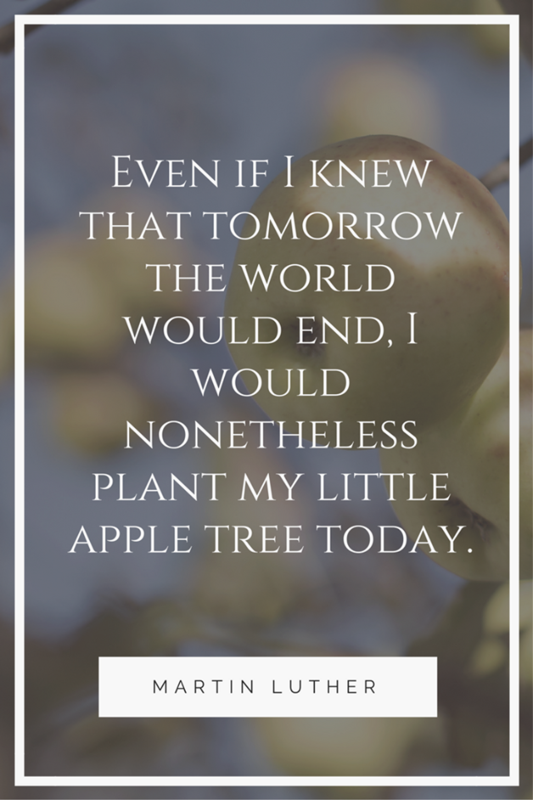 Although Luther never made any formal predictions as to when the world would end, he’d likely find little comfort knowing that we are approaching (not to mention celebrating) the 500th anniversary of his 95 Theses. I’m sure he was bewildered enough to find the world still around all the way back in 1546, when he lay on his deathbed—that’s how rapidly he had believed history was closing up shop. Still, there was a thread of Luther’s thinking that helped me understand the apocalyptic fervor I had once experienced first hand. I came to realize, first of all, that apocalypticism is almost as old as humanity itself. It was, moreover, a quintessential aspect of the Judaism in which Christ Himself was raised. Furthermore, belief in the End Times is not just a nutty tangent of faith but a fully intact worldview—that is, a cohesive and robust system of making sense of all reality. It provides a way of navigating the tension between the past and the future and legitimizes the struggles of the present moment. 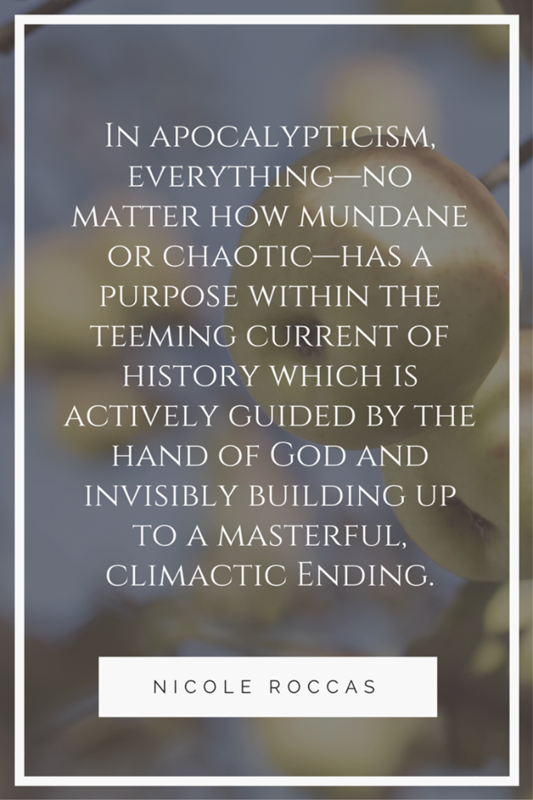 In apocalypticism, everything—no matter how mundane or chaotic—has a purpose in the teeming current of eschatological history, which is actively guided by the hand of God and invisibly building up to its masterful, climactic End. I didn’t necessarily need this to be my worldview, but I was beginning to understand how and why others in my life could find so much comfort and legitimacy in it. Luther’s apocalypticism, too, provided something that had been lacking in what I experienced of apocalypticism growing up. For him, the nearness of the End was hardly an excuse to fritter away time, twiddling one’s thumbs in despair until Christ returns. Instead, it was a penetrating call to action, to work and redeem and actively love one’s neighbor—not just in word, but especially in deed. It was this vein of his thought that made apocalypticism existentially meaningful to me—it offered a way of being in this world I could respect and even find comfort in. I didn’t know it then, but I was making peace with the apocalypse, the shadow that had haunted my experience of faith and church for much of my life. 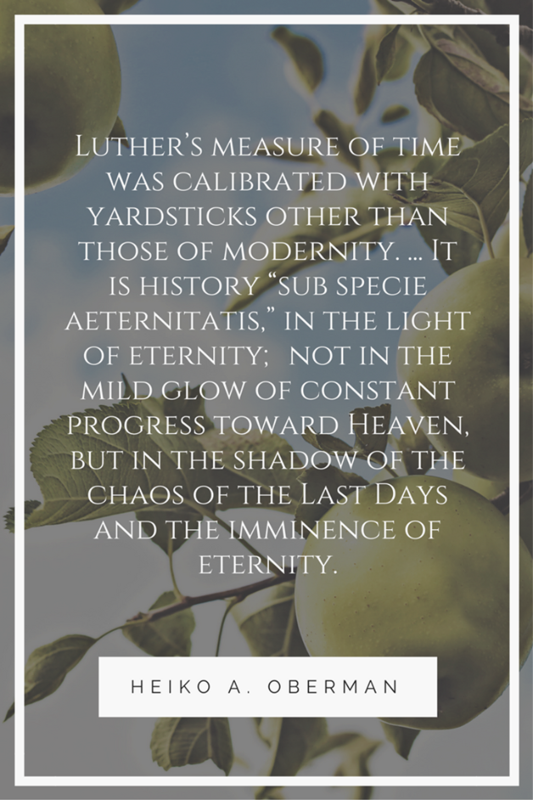 I found in Luther’s approach to the End Times what I termed an “existential apocalypticism,” a mode of faith that was less caught up in pointing fingers at cosmic signs and political mayhem, and more interested in working to bring about goodness and grace in this world. My flirtation with historical, liturgically oriented churches eventually led me to convert to Eastern Orthodoxy. In many ways, this is about the least apocalyptically zealous corner of Christianity you could possibly find. 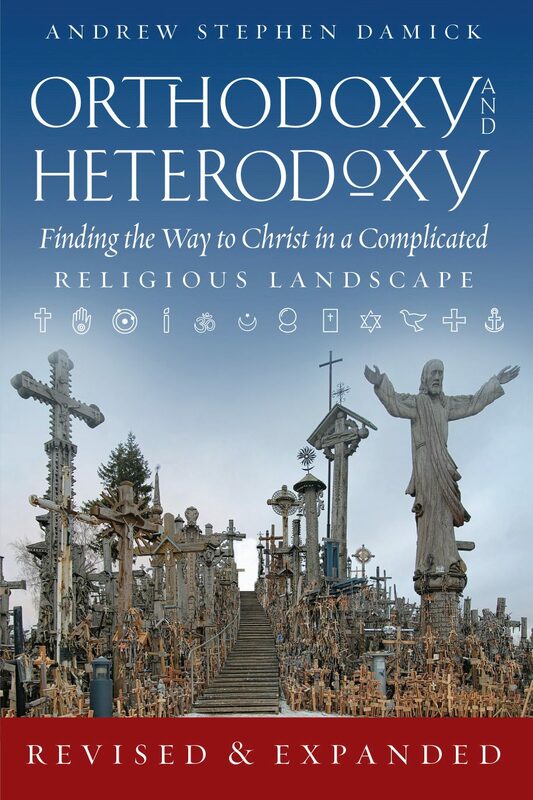 In other ways, however, Orthodoxy is perhaps the most “eschatological” of all the churches. In our liturgy, we “remember” and offer back to God all the saving events that have already come to pass: “the Cross, the Tomb, the Resurrection on the third day, and […] the Second and glorious Coming.” That is to say, in liturgical time, we look back on the Second Advent as though it has already occurred and come to fruition—because, sub specie aeternitatis (in the light of eternity, as Oberman phrased it), it has. In other words, the salvation of this world has already happened, it is already a reality. Because of this, our vocation and imperative in this life is not too far removed from how Luther saw things. We are to perpetually engage in recovering the reality of our salvation from the veil of distraction and seeming meaninglessness. And we are to do this actively and tangibly, not only on behalf of ourselves but for the sake of our neighbor and our enemies and—through prayer—the entire world. I would never have been able to appreciate this dimension of faith had I not first come to terms with apocalyptic belief. Luther was a pivotal stepping stone on that journey, and for that I’ll always be grateful for the great reformer. Oberman, Luther: Man Between God and Devil (New York: Image Books, 1989), 12. Robin Bruce Barnes, Prophecy and Gnosis: Apocalypticism in the Wake of the Lutheran Reformation (Stanford: Stanford University Press, 1988), 2. Nicole Lyon, “Between the Jammertal and the Freudensaal: the Existential Apocalypticism of Paul Gerhardt (1607-76)” (MA Thesis, University of Cincinnati, 2009), 3. Thank you for this beautiful piece, it really made me think. Maybe how I feel about the notion of perpetually expecting the world to end is how Protestants feel about the Orthodox never knowing if we truly achieved salvation – one thinks to oneself “How can they live like that?” when in fact they do not necessarily live like that, no matter how alien and frightening that worldview seems.